As you might have noticed in our email newsletter or in the editors comments at the start of last issues PDF, we have been planning a landscape photography conference for November of this year and we started selling tickets to subscribers a couple of weeks ago. A few people have mentioned that they had missed this news and others had asked for more information about the event and what we hoped to get out of it. To this end we thought an short description of our own goals for the event and what we expect to be able to include wouldn’t go amiss. 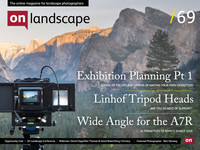 The idea of a landscape photography conference has been in the back of our minds for a while now. Every time any of us ends up at a ‘physical world’ event we all comment about how nice it is to catch up with old friends, meet new ones and talk about landscape photography. But it was a couple of events last year that made us realise how a properly organised event could make a great catalyst to bring together landscape photographers of all sorts. Working out a location for the event wasn’t easy. There are many conference facilities throughout the country but quite often they are either a long way from the centre of the country or they are in large (dull) urban conurbations. In the end the Rheged Centre was suggested by a few people and it ticked nearly all of our boxes. Location wise it was a little bit further North than we had wanted but it is next to one of the main motorways (the M6) it has good train access (3hr direct train journey from London, 4 hours from Bristol with one change, 2 hours from Edinburgh) and more importantly it sits on the doorstep of some of the most beautiful landscapes in the country (we were hoping people could combine the conference with a 'last days of autumn with snow peaked mountains' photography trip). Rheged also has brilliant facilities - an IMAX Digital screen with great audio presentation facilities, space for sit down dinner, an open area in which we can include an exhibition of prints and space for retail exhibitors to show their offerings and for individuals to give presentations and potentially to run critique sessions. We’ll have nine talks in total, five on the Saturday and four on the Sunday. This allows us to start the first talk at 9:30am and have the day finished at 5pm with each talk taking an hour. This gives us a half an hour between each talk and an hour for lunch. These are to be confirmed but we’re expecting a mix of retailer, workshops and tours, publishers and others. We don’t have any organised events for the Friday evening but we will have an informal gathering at the Rheged for people to take a first look at the exhibition and say hello. This will kick off around 6pm. We’ll have more details in a few more weeks, and will ask you to confirm whether you can make it or not (so we know for numbers!). With such a great space outside the auditorium we couldn't ignore the chance for an exhibition. We decided to include some of the best landscape photography from contributors to the magazine over the last few years (permission allowing) and they will be on display just outside the auditorium and just below the cafe and exhibitor stands - a great place to mingle and chat. We’re currently working out topics for the talks with our speakers and want to make sure we cover a range of topics that includes some inspirational imagery. There will be time for a short question and answer session after each talk. There’s list of who we’ve got lined up on the conference information page. Let us know if there are specific topics are areas you’d like to see covered. The conference isn't just an excuse to get a bunch of people to give some talks - one of our main goals was to create a focal point for landscape photographers to discuss their passions and be inspired by great photography and presentations. We really hope you can join us and please let us know if there is anything you would like to see that we haven't mentioned. To book on the conference please click here.